With all of this glorious sunshine we are currently enjoying, it is the perfect time for thinking about ways to entertain children outdoors. My children love to be outdoors and we love our woodland walks and visits to the park but when it is nice every day, I still have things to do at home so it is nice to find activities for them to play in the garden where I can keep an eye on them. It is also nice to have plenty of choice for when friends visit with their children so there are no arguments over who gets a turn first. Water activities are a must! There is so much a child can do with water and it isn't exclusive to a paddling pool. We have always loved having some kind of water activity table for as soon as a child can stand up. Fill it with cups, watering cans etc and they can have a world of fun making 'drinks', watering plants or even starting a water fight. I keep looking at garden water slides. It would either be a genius idea or a big mistake, I can't quite decide which, but they look like so much fun! For babies I love the idea of a water filled play mat like the teletubbies water mat. It can be popped on the grass in a nice shady spot and gives the stimulating feeling of water play without the mess. Bikes, scooters, skateboards etc. are always a winner. We have our Cosy Coupe for the kids to drive around in, scooters for each of the children and a range of bikes to suit all ages. We have a scuttlebug bike which is great as it is foldable, a toddlebike which is great as a first stage before a balance bike, a Cruzee balance bike which is amazing for teaching balance. We are hoping Zach will go straight onto his bike without stabilisers this summer after years of using his balance bike. Having a range of ride-ons available means children can race or ride together. Is there anything more versatile than a ball? So many games have been created around them. You can get little football goals or basketball nets, golf sets or boules. If you are a bit nervous of trusting a child with a ball near windows you could opt for something like a swingball with the ball attached. 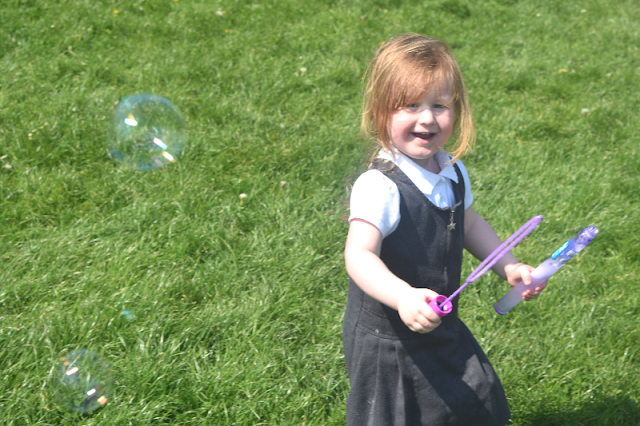 If you are looking for outdoor activities that don't take up space, chalks and bubbles are always popular here. Last Summer I had all of the kids in the street drawing chalk murals on my front garden path, much to a few neighbours disgust at the mess. In my opinion it creates hours of fun, promotes creativity and imaginative play and it is easily washed off with a little water! Let me know what your summer must-have items are in the comments below.